Clean and aquatic, ideal by your pool or on your patio or deck. The Heritage Park Stacking Sling Chair is a great solution for your next party or get together. 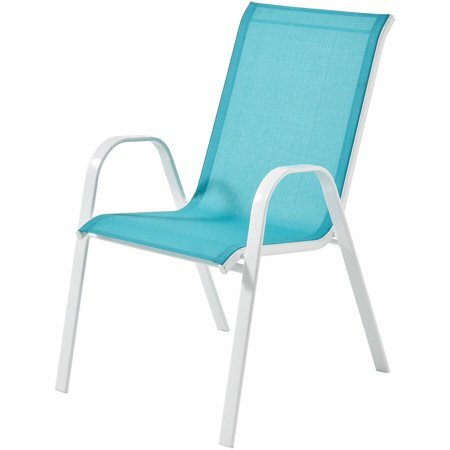 Includes one stacking chair covered in a clean Turquoise ventilated, fade resistant fabric that is exceptionally comfortable and is tested to hold up to 250 pounds. The frames are powder-coated steel in an attractive glossy White finish and have a one year warranty. These tacking chair pair nicely with other Bistro, Dining and Seating Sets. solid, though lightweight. espresso frame which won't rust. great design. incredible price. I ended up getting the blue, green and aqua version because it went better with my table. They are sturdy, comfy and easy to clean. The price is hard to beat as well. Whenever we see them go down in price we buy a couple more. This was great when I bought it, last spring. I used it all summer and it was fantastic. But today (Mar. 13, 2019), one year later, parts of it have rusted and come loose so it can't be used anymore. I sad down and it broke. So I say it's a great buy for one season. I did leave the chair out on my front porch, which is covered, over the winter. I live in central Texas. By the way, I plan to buy another one with the understanding it will be a one-season chair.